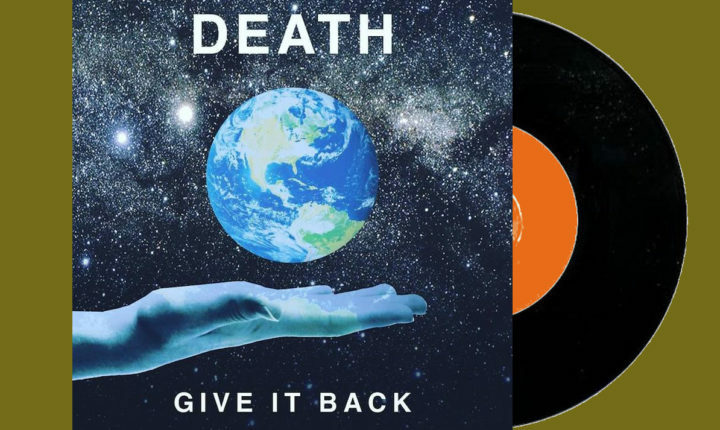 A deeper look at the grooves pressed into the “Give It Back” 7” single by Death. You’ve got to respect Death for the way the band has chosen to conduct itself, over the years. Really think about it, reader; this is a band who, since changing its name and turning to punk rock in 1976 [Death started in 1973 as a funk band called Rock Fire Funk Express –ed], has only released six albums – most of which were released long after they were originally recorded anyway. It goes without saying that no one in the group has really taken themselves seriously as a band and have only done it for fun, when there was time. It might sound ridiculous, but that pigheaded refusal to acknowledge their own real value as a pop or punk band has kept their releases exciting; they put out material when they feel like it and/or have time and that music always appears gleaming with promise because everything about it is an escape from the everyday for everyone involved – both listeners and for the band itself. That, presumably, is what has kept the music light and energetic. All of those aforementioned aspects are present and accounted for from the moment that the “Give It Back” seven-inch’s title track opens the A-side. There, amid a simple beat, formulaic bass (which is locked tightly to the song’s chord progression) and a brilliantly poppy guitar part, singer/bassist Bobby Hackney keeps his inspiration (and lyric sheet) simple and vague (how else would one quantify lyrics like “When we were children, we made believe/ We grew up to find out life ain’t what it seems/ Day in and day out, you ask ‘Is this all?/ If life is a party, then where is the ball?’”) as he laments the perils of growing up and begs to go back to simpler times. In almost any other band’s hands, this story would quickly break down into a miserable lament of lost opportunities, but it never makes that turn in Death’s hands; for four minutes, the band keeps the mood light and bouncy, and concedes that they owe the world and need to give back for all the fun they’ve had. It’s cute and responsible – a perfect balance between young fun and adult responsibility. For its part, the B-side song “Playtime” angles a little more toward a genuine punk sound (in an Iggy and The Stooges or MC5 kind of way) but, unlike those who have attempted similar punk styling before, there is precisely no veiled darkness waiting in the wings here. When the band calls out the song’s title as a choral rejoinder and then follows it with lines like “Grab your toys/ Everybody in/ Everybody wins/ Make some noise,” there’s no doubt that the song is just a genuine call to have fun. It’s an attractive call too – the guitars supplied by Bobbie Duncan split the difference between energy that is frenetic and fun-loving in the same tradition that bands like The Vaselines, The Replacements, The Who and The Fastbacks did. The “Give It Back” 7” is out now. Buy it here, directly from Death.